Studied with: M. Cherkasky, a member of the New York Philharmonic. Played for: Principal with the NBC Symphony under Toscanini from 1939 to 1954. Prior to that, he played with the Detroit Symphony. 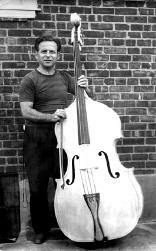 Instruments: Mr. Sklar is shown with an instrument he built between 1940 and 1948 before he varnished it. Comment: Even though there is a legend that Toscanini made all of the bass players in the NBC Symphony switch to French bow, Philip Sklar always played German bow while in the orchestra. He taught his son Martin to play French bow as he thought it would be prominent by the time Martin began to play professionally. Philip played using a 4-finger left hand system as does his son Martin. (Thanks to Martin Sklar, Philip's son for the above picture and information.